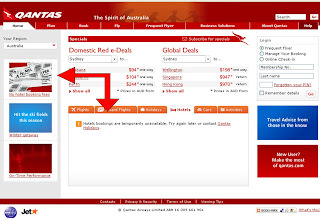 Bad day at the office for Qantas.com. First time I have seen on their website a promotion around "no hotel booking fees" and at the same time their "hotel bookings are temporarily unavailable" Oops. Image below. Well, you can't accuse them of misleading advertising - definitely no booking fees if you can't book!